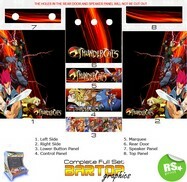 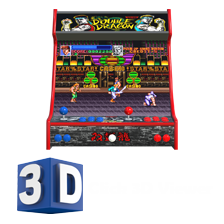 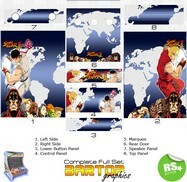 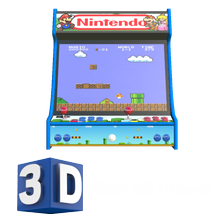 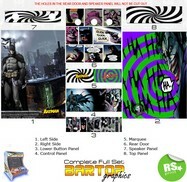 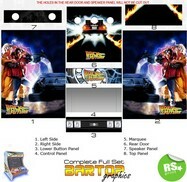 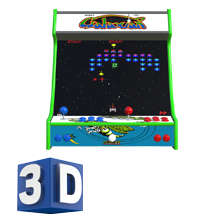 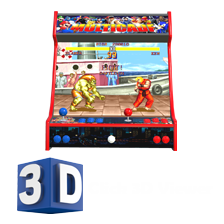 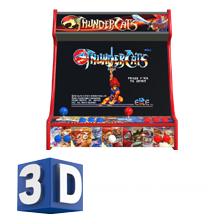 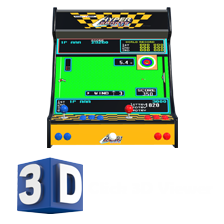 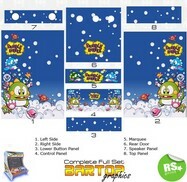 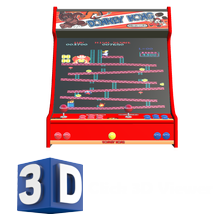 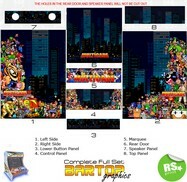 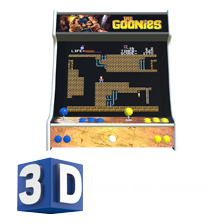 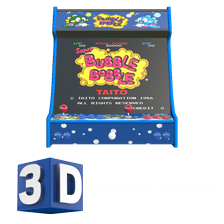 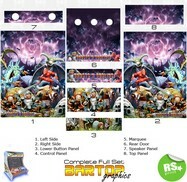 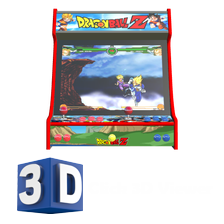 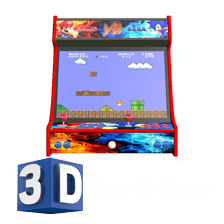 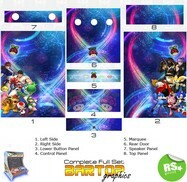 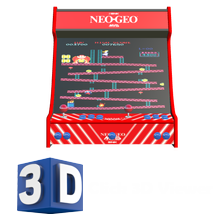 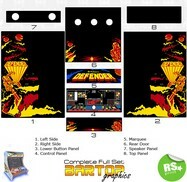 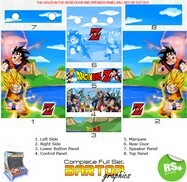 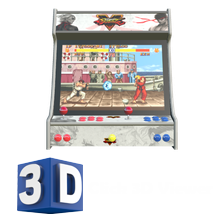 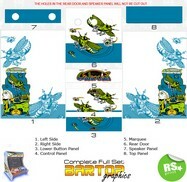 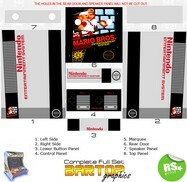 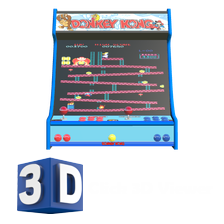 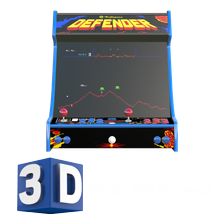 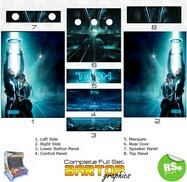 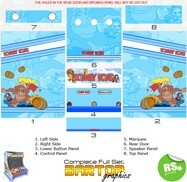 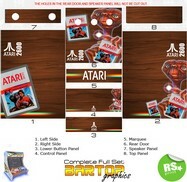 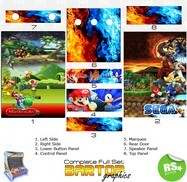 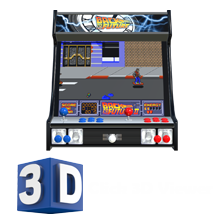 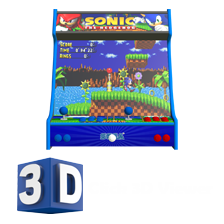 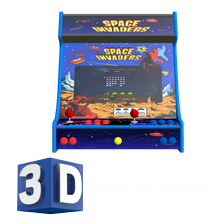 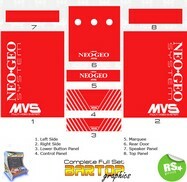 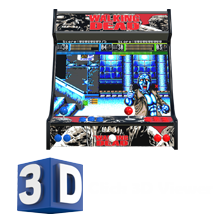 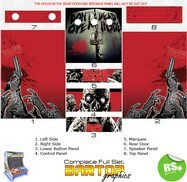 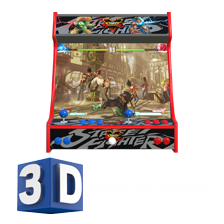 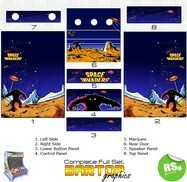 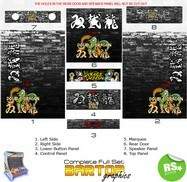 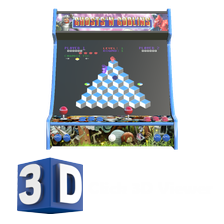 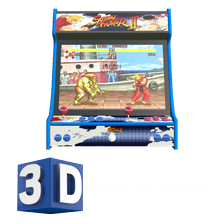 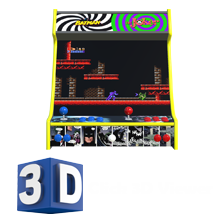 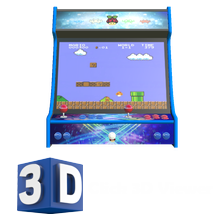 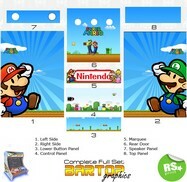 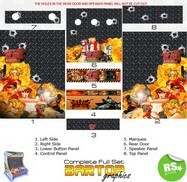 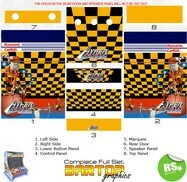 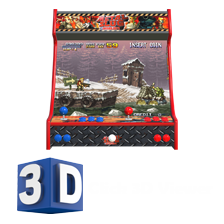 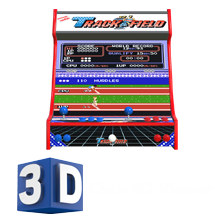 THIS IS FOR A COMPLETE FULL SET OF BARTOP GRAPHICS FOR A STANDARD SIZE BARTOP MACHINE. 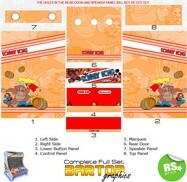 IT INCLUDES BOTH SIDES, MARQUEE, CONTROL PANEL, LOWER FRONT PANEL, REAR DOOR, SPEAKER PANEL AND TOP PANEL. 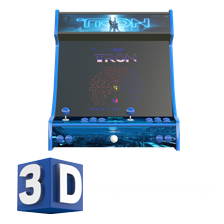 WE ALSO HAVE A HALF SET AVAILABLE WITHIN THE OPTIONS WHICH CONSISTS OF BOTH SIDES, MARQUEE, CONTROL PANEL AND LOWER FRONT PANEL. 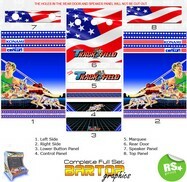 YOU WILL NEED TO EMAIL US AFTER PURCHASE WITH HEIGHTS AND WIDTHS OF EACH PANEL YOU WANT TO COVER INCLUDING A 5mm BLEED AROUND EACH GRAPHIC TO ALLOW FOR MOVEMENT. 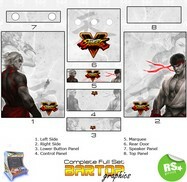 KEEP THE MARQUEE THE CORRECT SIZE AS TRIMMING MAY LOSE SOME OF THE MAIN IMAGE. 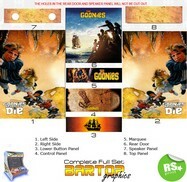 PLEASE BE AWARE THE PRICE FOR THIS GRAPHIC SET IS ONLY FOR A MACHINE NO LARGER THAN 700mm IN HEIGHT X 550mm LENGTH X 550mm DEPTH. 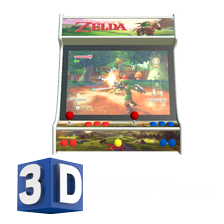 IF YOU MACHINE IS SLIGHTLY LARGER PLEASE LET US KNOW BEFORE PURCHASE SO WE CAN SEND YOU AN AMMENDED PAYPAL INVOICE FOR THE INCREASED SIZE. 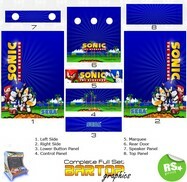 WE ARE GOING TO BE UPDATING THIS PAGE EVERY WEEK WITH NEW FULL SETS SO KEEP CHECKING BACK WITH US. 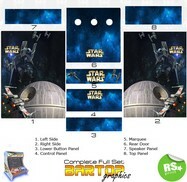 WE ALSO HAVE FULL SETS FOR ALL THE OTHER GRAPHICS YOU CAN SEE ON THE WEBSITE SO PLEASE EMAIL US AND WE CAN SEND YOU A VISUAL SAMPLE OF EVERTHING TOGETHER. 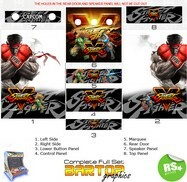 SEND THEM TO THE EMAIL ADDRESS BELOW, THERE IS NO EXTRA CHARGE FOR THIS SERVICE. 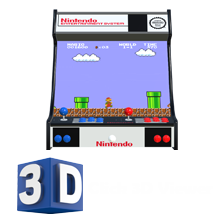 ALTERNATIVELY IF THE IMAGES ARE VERY LARGE USE A THIRD PARTY DELIVERY SYSTEM SUCH AS DROPBOX, WETRANSFER OR ONEDRIVE. 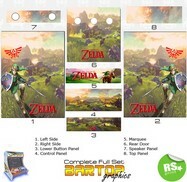 THEN JUST SEND US THE LINK TO THE FILES.